Above, Alicia Vikander who just won Best Supporting Actress for “The Danish Girl” Not necessarily a sure bet. And below the COMPLETELY unexpected win by most, (but not me, I PREDICTED it!) 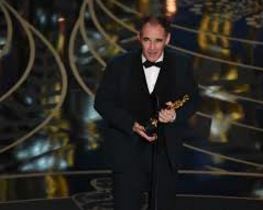 Mark Rylance winning Best Supporting Actor for “Bridge of Spies.” And then “Spotlight” winning Best Picture! Sublime justice!